Syncplicity Review from BestBackups, evaluating features, security, pricing, and customer support, and looking at its main strengths and weaknesses. Syncplicity is a good product that fulfils basic backup requirements well, although a lack of innovative features or truly exceptional performance make it unlikely to stand out from the crowd. You can read a detailed review below or sign up now. Syncplicity offers two different subscription plans to personal users; a free version, which lets you access 10GB of storage space, and a paid version that offers 100GB for $60 per year. This is a comfortable price compared to many other providers, although the amount of storage is very limited, potentially restricting Syncplicity’s customer base. The reason for this restriction is in part that much of Syncplicity’s focus is on reaching corporate audiences. 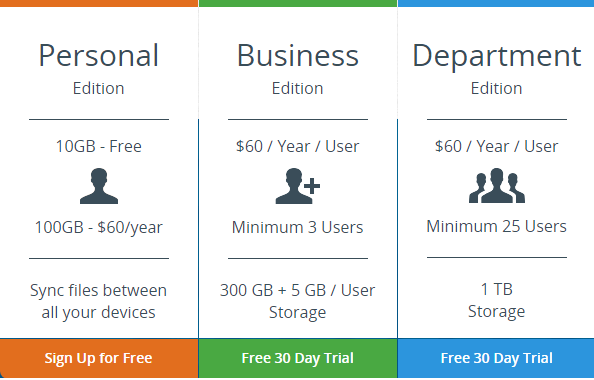 Their smaller Business plan is available for a minimum of three users and offers 300GB of storage space, plus an additional 5GB per computer, while the Department edition has the same features but provides 1TB for a minimum of 25 users. Both plans are available for $60 per user per year, or you can give them a trial run for 30 days free of charge. In addition to these standard business plans, there is also an Enterprise edition of Syncplicity, which features hybrid Cloud storage and unlimited space for $150 per user per year. If you decide to sign up for this, or any other paid plan, Syncplicity accepts most major credit cards. Syncplicity was created by Ondrej Hrebicek, Isaac Hall and Leonard Chung (all former Microsoft employees), and first launched to the public in 2008. In 2012, the company was purchased by EMC Corporation, which also owns RSA security and fellow backup provider Mozy, after which it was bought again by Skyview Capital in 2015. Syncplicity’s attempts to crack the business market have placed it in direct competition with Box, who claimed their former CEO Jeetu Patel in 2015. With more than 25,000 subscribers around the world today, however, Syncplicity remains a major player in both personal and business markets. There are no restrictions on the size or type of files that can be backed up to Syncplicity, but all uploads must be implemented manually (no automatic backups here). You can backup to the same account from an unlimited number of devices, and all updates to stored files are automatically synchronised. If you want to ensure that particular files are available offline at all times, you can ‘favourite’ them, which will mean that they are continually pushed to other devices. Enterprise subscribers also have the ability to save their files not only to the Cloud, but also what Syncplicity calls ‘on premise’ – aka. offline in separate Syncplicity data centers. This gives them not just one place to store their data, but two; increasing security and sparing the company from having to arrange physical storage elsewhere. Syncplicity is compatible with Windows and Mac operating systems, as well as Windows Phone, Android and iOS for mobile. All data stored with Syncplicity can be synchronised between multiple devices so that you can access current versions of your files from any place and at any time. There is one notable restriction, however, insofar as files cannot be synced individually – only when they are in folders. When it comes to sharing your documents, you can grant other Syncplicity users the permission to access both individual files and entire folders. This access can take two forms – either as a Reader or an Editor. The former can only view shared data, while the latter can make changes to files or add new content. Everyone that you share folders with can share them in turn, although the original author of the content (the ‘owner’, in Syncplicity-speak) is ultimately able to change permissions or deny access to any user, regardless of who invited them. They are also the only person that is ever able to delete files or folders. Syncplicity doesn’t impose any maximum limit on how many previous versions of your files can be saved for later retrieval. Settings default to retaining the most recent ten versions of your files for 30 days, although you can edit this by setting how many versions you want to save and how long you’d like them to be kept for. In addition to versioning, Syncplicity also offers the opportunity to recover files that have been deleted from your hard drive. Once again, you can alter the specifics of the service at will and without limitations although the default is to retain deleted files for 30 days. 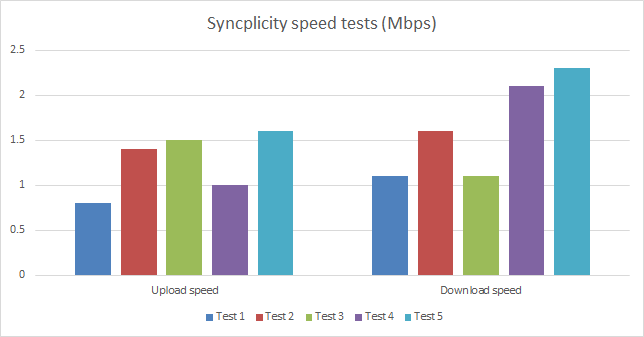 We ran some tests to get an idea of Syncplicity’s upload and download speeds, as speed is of the essence when you’re transferring large amounts of data. We did this by first uploading five files and manually timing how long it took the transfers to complete. Next, we took the number of MB in each file and divided it by how many seconds the upload took, then converted our answer into Mbps. Download speeds were calculated on the same basis, and we put all of our results into a simple graph to give you an idea of what to expect. With most providers recording upload speeds of between 2 and 3 Mbps, Syncplicity’s average of 1.3 Mbps was not particularly impressive. A 100MB file took around nine minutes to backup, meaning that larger files could leave you waiting for a long time. Downloads were unfortunately even less impressive, averaging just 1.6 Mbps compared to the typical rate of 3 to 4 Mbps recorded by other providers. While this shouldn’t be too much of a problem if your primary objective is to sync and share your files, if you’re planning to upload a more extensive amount of data, you may want to look for a faster service. As with all speed tests, it’s worth remembering that performance can vary depending on external influences such as your broadband connection and even the quality of your router. Although we do everything we can to give an accurate representation of transfer speeds, then, our results should be taken as a guide only. Syncplicity encrypts your files using AES 256-bit symmetric encryption both during transit and while in their data store, and all data is transferred via HTTPS, using TLS/SSL protocols. Staff access to files is highly restricted, and encryption keys are stored in an independent database. In addition to this, Enterprise subscribers using on-premise storage can rest assured that their files will not pass through the cloud during transfer – instead, they are moved directly from your devices to Syncplicity’s data store. So far so good, but Syncplicty’s personal accounts fail on one crucial point – files are first encrypted during transfer rather than when they’re on your computer, so encryption is not end-to-end. This means that there is time during which your files are unencrypted, unprotected and in the hands of the company, leaving you far more vulnerable to an invasion of privacy than if you use a provider that encrypts your data before it leaves your PC. Another important feature is also absent from personal plans; namely the ability to set a private encryption key. This service allows you to set a password that only you will ever have access to – it is never visible to or stored by your backup provider in plain text form. This means that, should anyone hack or demand access to your stored data, the information needed to decrypt it is only held by you. While both of these features are available to business users, personal subscribers concerned about security may want to consider other, more secure options such as SpiderOak or CrashPlan. Alternatively, if you don’t mind making the backup progress a little more complicated, Syncplicity supports files that have been protected by independent encryption services. 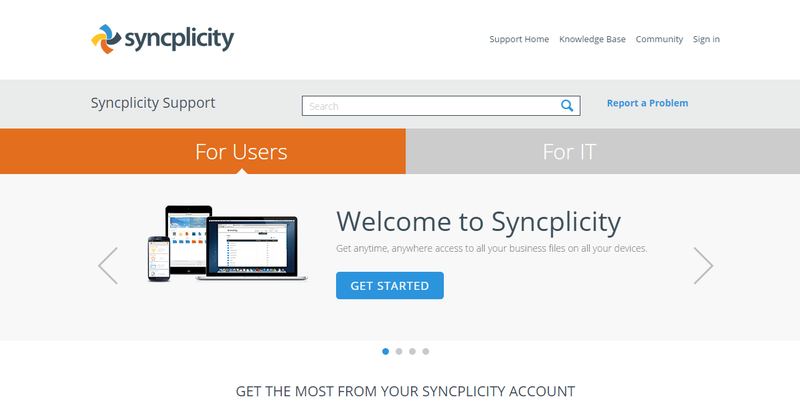 The Syncplicity website features a range of different resources including forums, an FAQ dedicated to troubleshooting common problems, a Knowledge Base and the Syncplicity University, which features video tutorials. There’s enough information across these platforms to meet the majority of needs, although most content appears to be written primarily with business users in mind, so can be a little confusing if you’re using a personal account. You can also contact Syncplicity staff directly by submitting a support ticket, although there is, disappointingly, no option to communicate via live chat or phone. Having sent a support ticket, we had to wait a while for a reply – 36 hours in fact, much longer than the average time of around six hours taken by other providers. Syncplicity’s response was short but concise and professional and gave us all of the information we needed. Along with social media profiles on Facebook and Twitter, Syncplicity also maintains a blog that is updated every few weeks with in-depth company news and developments. Their Twitter profile has 5,000 followers and features regular company promotions, as well as occasional reposted articles on industry-related topics, while their Facebook page receives less frequent attention. Syncplicity’s 7MB installation file is easy to download and run, and getting set up is a quick and simple process. Don’t be put off if they invite you to log in with a corporate account when you first sign up – just proceed as normal, and you won’t encounter any problems. Syncplicity runs primarily from a pop-up in your taskbar, from where you can choose whether you want to open the Syncplicity folder on your computer, manage your backed up data, visit their website or change your settings. While it’s not difficult to navigate this way, it does seem unnecessarily convoluted, as each function runs from a different location. A more centralised system would be more intuitive to use, and would avoid the hassle of working from multiple places at once. Once you’ve learned your way around, however, Syncplicity is easy to use, with easily recognisable icons and nothing too complicated to master. The Syncplicity mobile app allows you to both upload and download files from the Cloud, as well as sharing links to backed up content and tracking what changes have been made to favorite files and folders. On the whole, the app is easy to use and is an effective way to access Syncplicity from mobile devices. Syncplicity is an undeniably solid program that performs the majority of basic backup tasks in a simple and effective way. Although their security features are likely to leave privacy-conscious users feeling uncomfortable, those looking for a straightforward way to store and share files will find little to complain about here. Unfortunately for Syncplicity, however, their personal plans have very little to make them stand out in the competitive world of online backup providers. This is fine for customers not bothered with frills and innovations, but it puts Syncplicity at a disadvantage in a market that relies increasingly on new product development to grab audience attention. What do you think of Syncplicity? Leave a comment with your thoughts here.